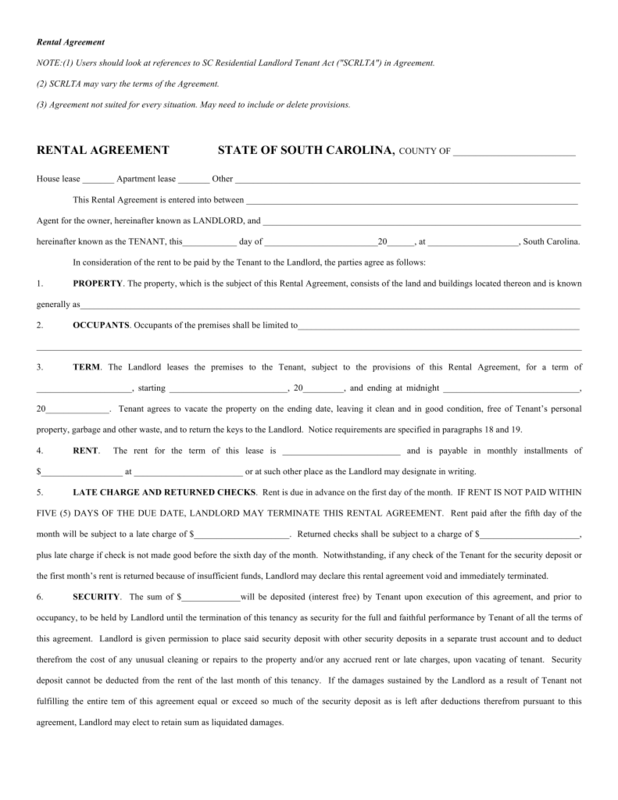 The South Carolina lease agreements are real estate contracts used for the purpose of a landlord to allow the renting of the property by an individual or entity. All documents must be written pursuant to the State laws located in the Residential Landlord and Tenant Act (Title 27, Chapter 40). Once an agreement has been signed by both parties they are legally bound to its terms in their entirety. Rental Application (Form 460) – Tool used for landlords as a way to verify that a potential tenant is credible before authorizing a rental contract. Association of Realtors (Form 410) – This document is provided by the South Carolina Assoc. of Realtors for standard tenancies between landlord and tenant. Commercial Lease Agreement (Form 400) – For tenancies that are work or business related. Not for the use of livable space. Lease with Option to Purchase Agreement – Standard residential document with the added language that gives the tenant the right to buy the property. Month to Month Lease Agreement (§ 27-40-770) – Known as a tenancy at will and renews every month with payment to the landlord. The term can be ended with at least thirty (30) days’ notice from either party. 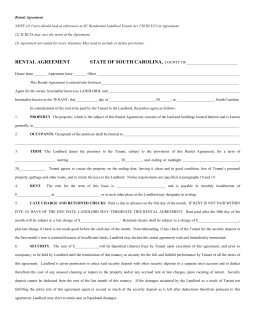 Room Rental (Roommate) Agreement – For persons living in a shared living situation. Standard Residential Lease Agreement – The most common type usually lasting around one (1) year. Sublease Agreement – To sublet, meaning that a person with a lease may turnaround and rent the same space during their term with the landlord. Most agreements require that the landlord consent to this type of tenancy. Termination Lease Letter – To cancel a month-to-month arrangement by means of sending this notice with at least thirty (30) days prior to the announced end date. Agent/Landlord Information (§ 27-40-420) – Any person allowed onto the property must be stated prior to or at lease signing along with the owner/manager’s name and address for legal notices. Lead-Based Paint – All residences that were constructed prior to 1978 are eligible to have lead paint in them and therefore the landlord must notify all new tenants. Unequal Deposits (§ 27-40-410) – If the landlord owns more than four (4) adjoining dwelling units units and imposes different security deposit amounts for different criteria of individuals the rules for setting this amount must be listed in a conspicuous place by the landlord or listed in the rental contract. The landlord must give the tenant at least twenty-four (24) hours before entering the premises and must be during the hours described in § 27-40-530. Maximum – There is no State cap. The landlord may charge as much as they deem necessary. Returning (§ 27-40-410) – Thirty (30) days from the termination date and the premises have been returned to the landlord.